Welcome back. This is the sixth installment of: “Keep a 5 year Journal.” At midmonth, I share my progress and the list of questions for the upcoming month. Click here to see all 12 months. This month I changed it up a little. I made all my cards ahead of time but did not date them. Each night when I sat down to answer a question, I picked one that I really felt like answering at that moment. For the card shown below, I purposely waited until after the 8th to answer the question because I knew I was having a girls’ gathering on the 8th. I rarely have them, and I wanted to document it–even in this small way. I’m still enjoying this project and as well as using the cards to practice techniques (like the art-journaling-inspired text on this one). I hope you’re still keeping this fun and I hope you’ll share how you’re doing in the comments. If you decide to keep a five year journal, or are already keeping one and would like to be featured in an upcoming month, please contact me. I’d love to share what everyone is doing. Tami Taylor writes for Get It Scrapped!, teaches at Masterful Scrapbook Design and previously owned Creative Passion Classes.com. To learn more about Tami check out her blog, The Taylor Life. I love the prompts. I found some little booklets at Barnes and Noble and do 3 months in each book. So fun. Thankyou so much! I found probably the same small set of notebooks at B&N today. I have been waffling back and forth about how I want to do this journal, but I think the compactness of the small notebooks will allow me to keep it in scope. For anyone wondering, this set of notebooks was bargain-priced at $5.98 and by Picadilly. The set consists of 4 lined notebooks, 100 pages each, 4 designs, and in a reusable box. The box measures about 4 x 6.
thank you for all the prompts! Such a great job! Thanks for following it. Hope you’ll share pictures when you get a moment. and am going to start. seems easy enough!! when can i expect august’s prompts?? i love having a question to answer!! totally helps me!! thanks for this! I’ve been collecting the prompts. I want to start in January 2013. Looking forward; thanks for the prompts and ideas. I love this!! I am downloading all the months. 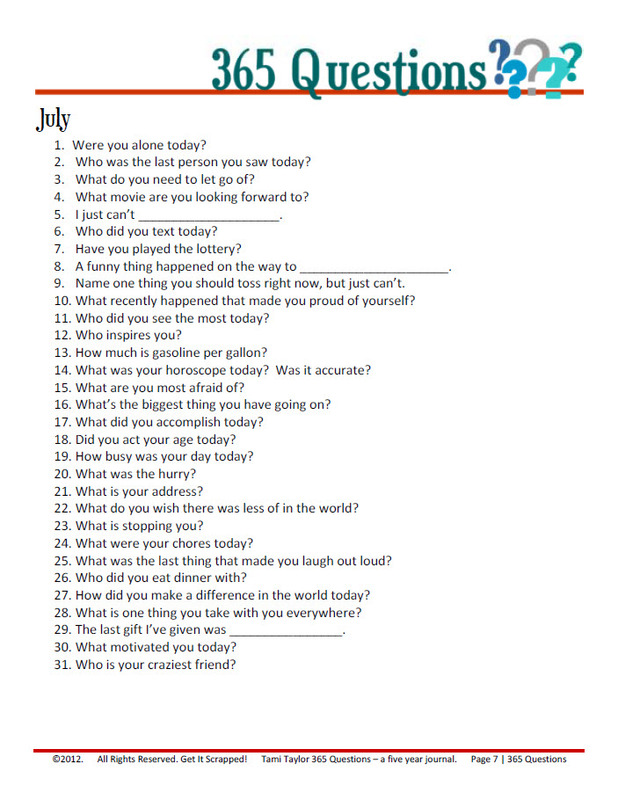 I don’t know if you’re aware of this but the image for the July questions leads to a January pdf. Love! Love! Love this idea! I writing in my journal about a month ago and looked at the last entry – it had been 2 months since my last entry and I haven’t visited it since. I don’t always make time each day. So smart!! Starting it today and challenging one of my friends to do the same. I love this idea. But I stumbled on it in July. So I will be starting Aug. 1. I’m always searching for writing/journal prompts. These are great. What I really appreciate is the going back in time and thinking about the same question. I guess it is never too late to do that. I ran into the same problem as Tiffany, trying to print out each month. July shows up as Janurary’s questions. Is anyone else having difficulty getting the July list? When I click on it January comes up every time! I see that the linked word JULY over the image went to the right place but clicking on the image did not and I’ve fixed that.